I hate to point fingers but if you're Scott Buck, responsible for Netflix's first Marvel dud "Iron Fist" and the lackluster snoozefest "Inhumans," then it could be considered a pattern. The showrunner developed ABC's newest foray into Marvel television following the struggling 'Agents of S.H.I.E.L.D.' and somehow lowers the bar even further. The story revolves around a royal family of Inhumans living on the moon with their subjects in a caste society. Close to being found by probing scientists on earth, some within the kingdom believe it's time to flee. If these characters were remotely approachable, likable, or interesting this could have been an exciting debut but instead, it's a dull and amateurish attempt unsuitable for functioning eyeballs. One of the major problems is the lack of sympathetic characters. It's hard to root for anyone but perhaps the supposed villain and the giant CGI dog, Lockjaw. Black Bolt (Anson Mount) doesn't speak because his mere voice could cause immense destruction and death. He along with Medusa (Serinda Swan) reign over this lunar settlement where the superpowered are esteemed while the powerless are sent to work the mines. They're hardly the warm and fuzzy leaders worth admiring. Maximus (Iwan Rheon) is the jealous brother of Black Bolt who'd rather abandon the moon and reign on earth. Through heavy exposition speeches, Maximus arranges a coup. Like the action on 'Iron Fist,' it's poorly choreographed and clunky. The fight scenes of the 1966 'Star Trek' television series were more inspiring. 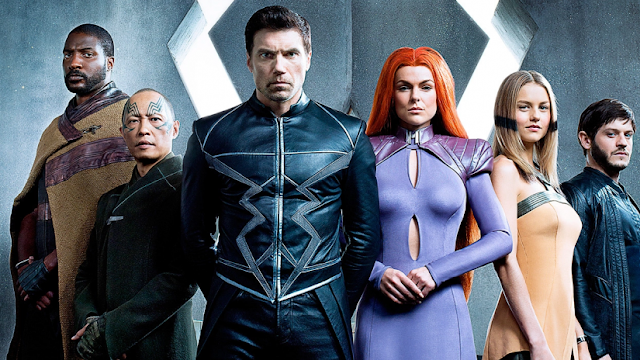 The aesthetic of 'Inhumans' wasn't as bad as others may have mentioned. It falls in line with 'Agent of S.H.I.E.L.D.' and could easily be part of that universe. It looks very grounded and that's part of the problem. This group of powerful beings acts and look very cheap and inferior not as grand as they should. Budget concerns explain the unspectacular story and sets. Medusas tacky wig and special effects get thrown out soon when Maximus shaves her head and the show's FX costs. Lockjaw, however, looks pretty good.